My aunt, uncle and two little cousins from Toronto made a stop at our place to have lunch with us before heading out to Mt. Sutton for skiing, about an hour and half of drive from Montreal. 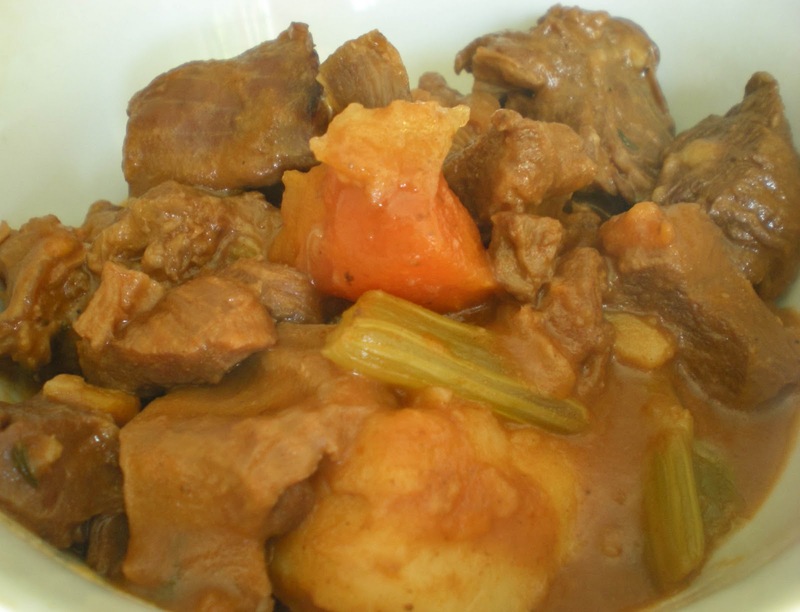 Knowing that they were coming, I already knew what to make: a hearty and comfy beef stew. 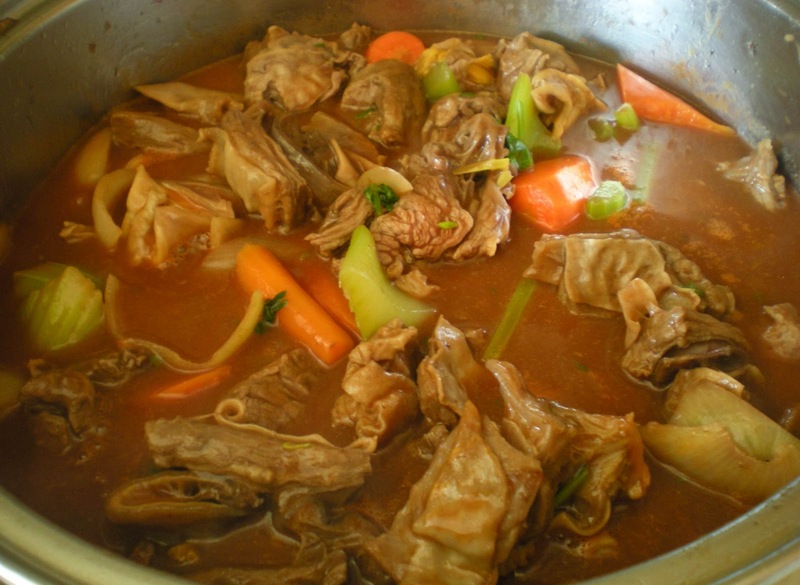 Who wouldn't crave for a stew before the cold weather ends? 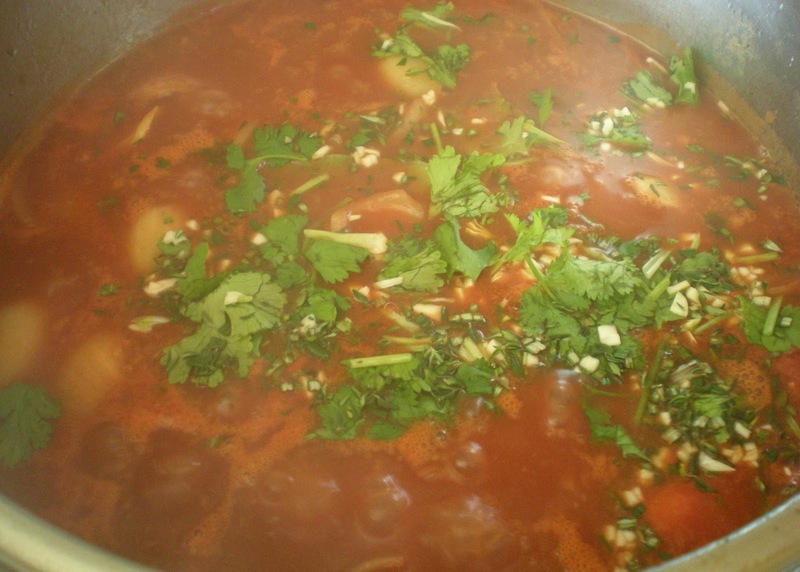 This stew is old-fashioned, nothing fancy with unusual spices and flavours. It is just your typical, hearty beef stew loaded with lots of vegetables and a generous amount of red wine to give a good depth of flavour. After tasting the stew, we were blown away of all the flavours that came out beautifully together. This stew has officially become one of our favourite dishes to make on the weekends. The meal would not be complete without desserts, so I did my #3 signature dessert, a refreshing minty berry medley. 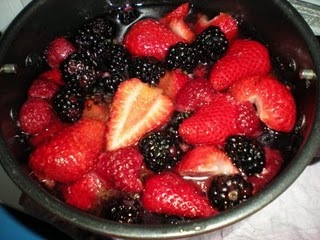 This is simply a mix of berries tossed in a lemon-mint syrup, which will make your guests' taste buds crave for more! Results guaranteed. For those who are new to my blog, I made this dessert almost two years ago, click on the image below for the recipe. 1. In a large pot, heat oil over medium-high heat. 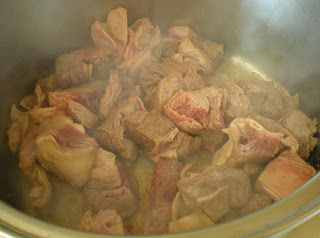 Cook half of the stewing beef until all sides are brown. Season with salt and pepper. Remove and set aside. Repeat process with the remaining ones. 2. Add in carrots, celery and onion and cook until onions are transparent, about 5 mins. 3. Add in garlic and sprinkle vegetables with flour. Cook for 1 min. Stir oftenly. 4. 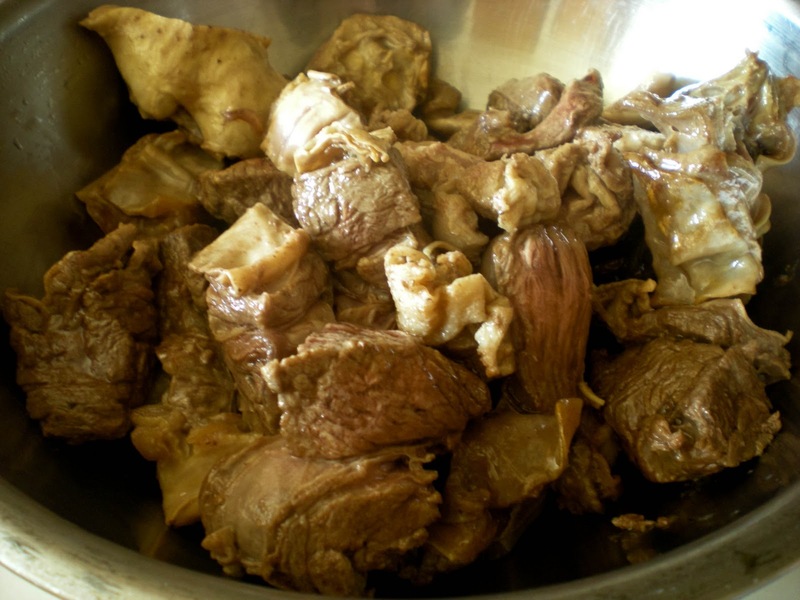 Gradually stir in beef stock and red wine. Stir in tomato paste, parsley, thyme, rosemary and bay leaves. 5. Return browned beef to the pot. Bring to a boil. Cover and simmer for 2 hours. 6. Stir in potatoes. Add more stock if necessary. Cook until both the meat and potatoes are tender, about 45 mins. Season with salt and pepper to taste. Serve. You don't have to have a lot of fancy ingredients to have a delicious meal. This is a fabulous looking stew. The stew looks really good. I don't eat beef, but I think that this would be good with lamb, and some bread! My daughter loves lamb stew. Have a good day! The stew looks hearty, filling, and delicious and the dessert looks tasty too. The stew looks very delicious. Old-fashioned food is always so classic. Looks delicious but will replace with lamb, beef is a no at home. yum! it certainly looks very hearty! will be soo good with bread or mash! 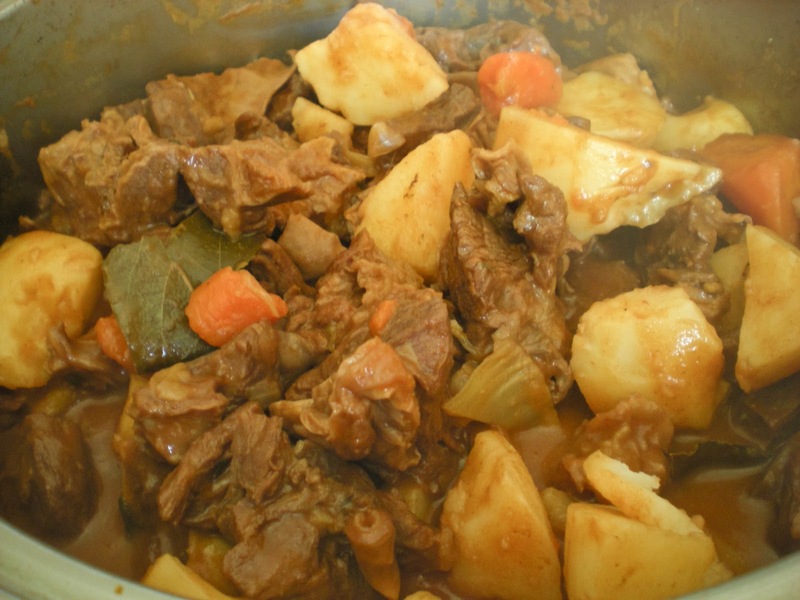 The stew looks perfect for the cold weather!! Actually, it just looks perfect!! Can you believe that when I was a kid I would rather get sent to my room then eat my mom's beef stew? lol Good thing my tastes have changed! Love the dessert too! What a perfect meal for your guests. I appreciate recipes, you can prepare ahead. I was ready for a new stew recipe; your sounds great. I love comforting dishes like this! So classic. Your guests are lucky! Sounds delish! One of my favorites. Your dishes are so amazing! I missed your comments last week on my chicken enchiladas. Actually they are my daughter's recipe, but the one this week is a family favorite for a quick and easy meatloaf. It's not at all gourmet although my sweetie has tried to add spinach and various other tweaks to make it more exciting. But the kids always rebel and we end up back at the plain old favorite. I'd love to hear your thoughts. There's nothing like a big bowl of comfort food to come home to, your stew looks fantastic. And what a delicious finish, those berries look amazing! 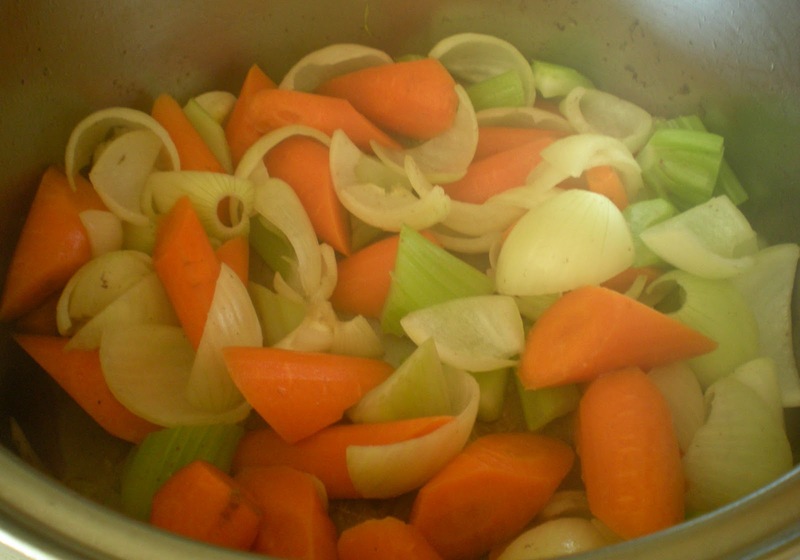 The best thing about stew is it's even better the next day. My mother always added dumplings to hers and I never got out of the habit! What a delicious and hearty stew! The berries look good too - I can't wait for fresh Spring berries to start dominating the market! This stew looks wonderful - we certainly still have stew appropriate weather in Tennessee. I love the combination of wine, tomato, and beef; a rich blend of flavors. i'm sure your relatives must have enjoyed that stew thoroughly. They must have been so impressed with your cooking and what a simple and easy way to create that wonderful dessert.If i were there, probably i'll just skip the skiing and enjoy another round of food from you!haha! 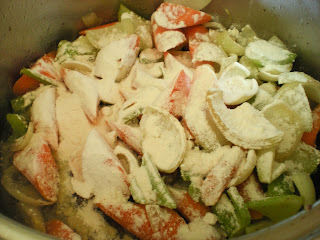 What a beautiful looking stew and I am definitely trying the dessert this weekend with all the fruit in my fridge! Love good old comforting beef stew. Looks heavenly. Lucky relatives. The dessert looks delicious too. I love stew even on those warm days :-)) This looks indeed flavoursome and tasty! I love stews more because they do not require baby sitting as you cook the.This looks wonderful! Yes, the stew and berry dessert were delicious. 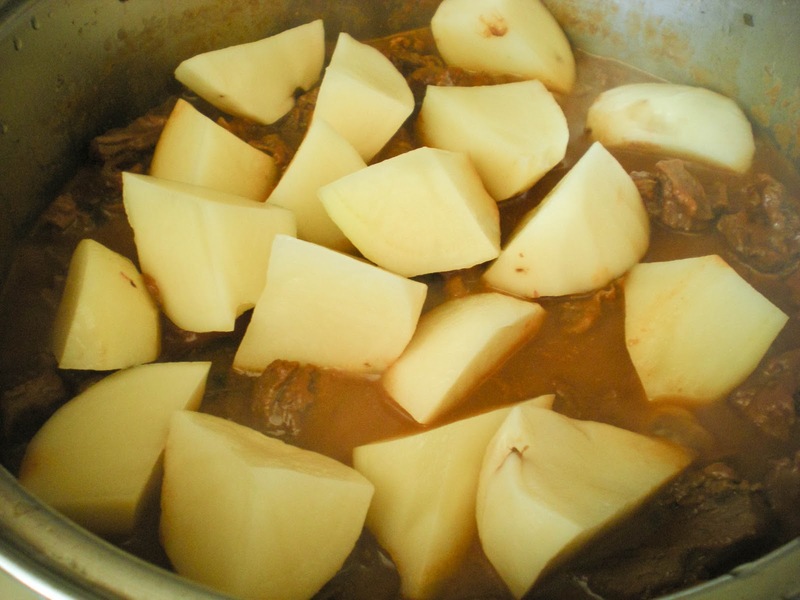 Your step-by-step photos of the stew are fantastic, I can almost smell everything as it comes together. If you've been reading my blog long enough, you know how much my husband loves stews like this! Who would've thought we'd all still be making stew at this time of the year, right? But it's such a delicious classic!